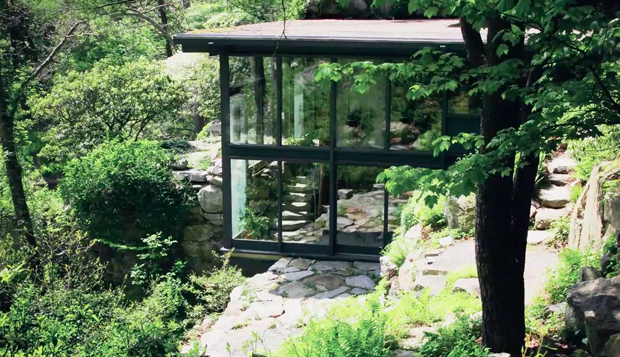 I thought we’d turn our attention to another mid-century master today, so I’ve sourced out this great short film which introduces Russel Wright’s Manitoga home and offers up further context to the American designers life. This project has been put together by women’s retailer Anthropologie, which I thought was a little random but welcome nevertheless as their assistant director of operation Lori Moss talks us though Russel’s beautiful home and how he came to build it. I have to apologise for continued reference to this but the last time I got this good a view of Russel’s home was in the well coveted publication by Leslie Williamson : Handcrafted Modern. One area of his home that has stuck in my mind for a while now is the stone door handle, I just love the quirky and individual look of it which is obviously a touch of class from an inspired creative mind. His outdoor bath which we don’t actually get to see here was another element that has stayed with me, however it was his use of stone throughout the property that really impresses me, the house is just so in tune with it’s surroundings. As Lori explains in the film below it was initially Russel’s homeware that brought him to the forefront of the design world, his chartreuse plates eventually turned out to be a piece of the best selling dinnerware in American history. I personally think it’s such a shame that he didn’t get involved in more architecture however because he was a great believer in incorporating good design in a market for the masses, perhaps he could have encouraged more individuals to live in homes that would also be at one with their environment. I guess this is wishful thinking on my part, but either way I hope you enjoy this film as much as I have, unfortunately projects like these are few and far between so we have to appreciate them while we can. If you’ve not got yourself a copy of Leslie’s book and you enjoy this piece I’d really recommend getting you hands on one. In the meantime why not head across to the Russel Wright Design Center and see what else you can learn about this legendary designer.